The ASP.NET Web Forms Gantt chart is a project management tool which provides a Microsoft Project-like interface for scheduling and managing projects. Its intuitive user interface lets you visually manage tasks, task relationships, and resources in a project. The ASP.NET Web Forms Gantt chart, is a project management tool which provides a Microsoft Project-like interface for scheduling and managing projects. Its intuitive user interface lets you to visually manage tasks, task relationships, and resources in a project. Manage complex projects on the go with project view, resource allocation, and resource histogram views available in the Gantt chart. A high volume of data can be loaded along with tasks dependencies without performance degradation by using virtual rendering. The ASP.NET Gantt chart allows the user to perform scrolling and other actions without any lag even when dealing with large numbers of records. Relationships can be specified between the tasks to determine the order in which the tasks need to be performed. The relationship links can be finish-to-start, start-to-finish, start-to-start, and finish-to-finish types. Gantt chart supports create, read, update and delete operations (CRUD) on tasks in the project. A task’s fields, such as duration, start date, end date, predecessors, etc., can be edited directly in their respective cells, or using edit dialog, or interactively using taskbars. The tasks in the project can be visualized with different timeline modes such as hour, day, week, month, and year views. The Gantt control supports resource allocation view for identifying the tasks occurring on same dates and the overallocation of resources in a project. 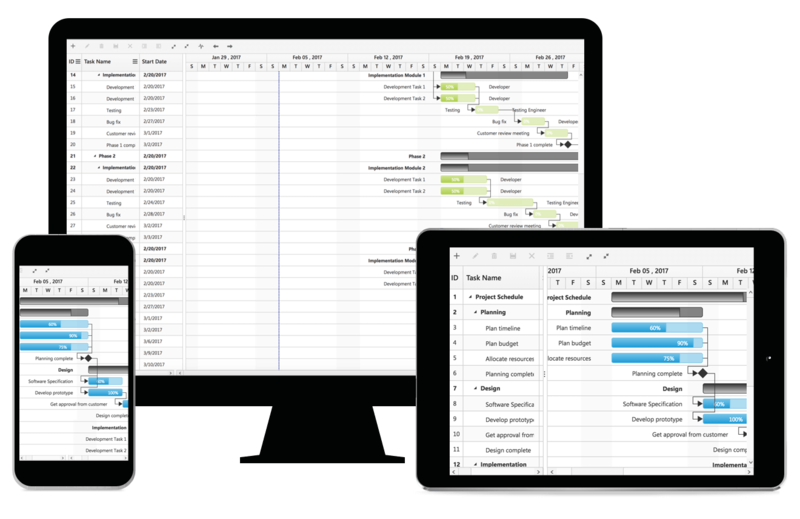 Gantt chart provides support for defining the working days or productive days in a week for a project. It is possible to define both continuous and intermittent days as working days. Critical path is used to identify the critical tasks along the project, which on delaying will delay the entire project schedule. Important days or events in a project can be highlighted using strip lines or event markers in Gantt chart. Gantt also supports highlighting holidays in a project. Baselines are used to compare the current progress of a task with the original planned or initial scheduled dates. Each task in the Gantt chart can be assigned with resources which represents the staff, equipment, materials, etc. Along with the inbuilt columns for viewing the task’s fields, custom columns can also be added in Gantt chart. It also supports column formatting, column resize, column reorder, column chooser and column menu features. The Gantt toolbar contains options for editing, searching, expanding, collapsing, indenting, outdenting, and deleting the selected tasks. It also contains options for adding new tasks. Custom toolbar items can also be added along with the inbuilt toolbar items. The projects in Gantt can be exported to Excel and PDF files. Gantt also supports wide range of customizations for page layout, header and footer in PDF export.